WASHINGTON, ABU DHABI, LONDON, TEL AVIV and MOSCOW — On Monday, US President Barack Obama and Russian President Vladimir Putin will have a formal, in-person meeting for the first time in more than two years. When they sit down in New York during the United Nations General Assembly, the situation in Ukraine will be at the top of their agenda. Also toward the top But just below it is the rapidly developing security situation in Syria, where Russian forces have spent almost three weeks building developing atwo pair of bases and moving fighter jets, helicopters and troops people into territory controlled by Syrian President Bashar al-Assad. In theory, the Syrian situation should provide common ground for the two leaders. Both have an interest in halting the advances of the curtailing the growth of the Islamic State group, better known as ISIS or ISIL. But while where the US insists Assad must go, Putin is looking to strengthen his longtime ally after more than three years of a civil war that has pushed millions of refugees outside of Syria. As Secretary of Defense Ash Carter told reporters on Sept. 24, "the United States believes that these two interests must be pursued in parallel." The status quo, then, remains that the US and its allies are funding rebel groups to fight against ISIS, many of whom would also like to remove Assad. Meanwhile, Russian forces are prepared to prop up Assad and strike at his enemies, whether they be ISIS or, perhaps, US-supported rebel forces, all while the US and allies are flying continuous airstrikes into Syrian airspace. "If Moscow is willing to concentrate any military power it wishes to bring to bear exclusively against ISIL, there may be room for coordination with the anti-ISIS coalition," said Frederic Hof, former US special adviser for transition in Syria. "If it elects to help Assad eliminate nationalist Syrian rebels, there could be severe complications in terms of airspace deconfliction." It's a messy situation that could explode into an even larger major conflict at any time — and there isn't much expectation that the Obama-Putin summit will solve it. Less than a month ago, Russia had no major military presence in Syria. But in recent weeks, Putin's government dramatically ramped up its operating footprint. The first major move was the arrival of equipment, apparently shipped in by An-124 Condor transport aircraft to Latakia airbase. 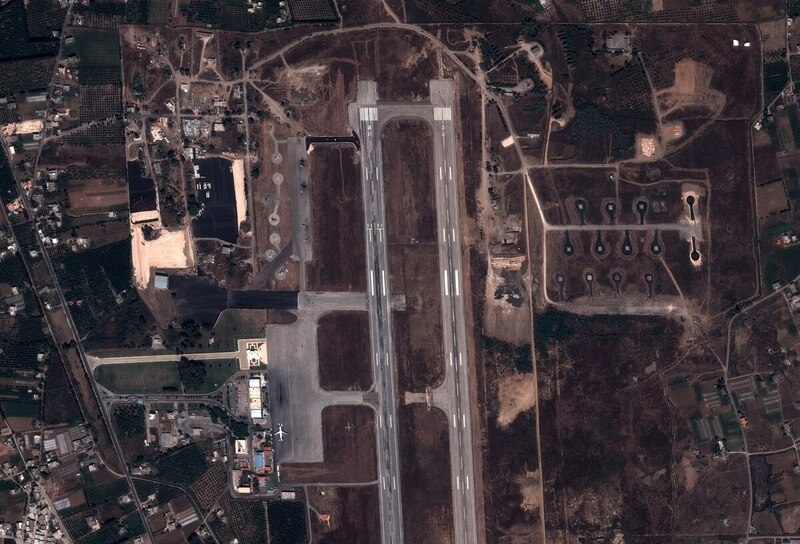 Quickly thereafter, publicly available satellite images picked up Russian Su-24, Su-25 and Su-30 aircraft at Latakia. Media reports indicate that the planes fighters were able to arrive nearly undetected by turning off their transponders and flying behind in the wake of Russian transport aircraft, with a stopover in Iran. Videos posted to YouTube published on Sept.ember 19 [EMBED https://www.youtube.com/watch?v=2Ksdh38h5-I] on YouTube show flights of Russian Su-30 and Su-24 fighter-bombers flying in formation with Il-76 tanker aircraft over the Homs province, bordering Iraq. Russia has also stepped up its regional presence with the expansion of its the Tartus naval station, a Russian military base leased on Syrian land since 1971, to handle bigger warships and transport vessels. Russia has deployed some 1,700 military specialists to Tartus, the Kommersant, a Russian newspaper, reported on Sept. ember 21, citing a Russian soldier stationed at the facility. Prior to this buildup, the small naval station at Tartus was manned by just a handful of Russian military servicemen and civilian contractors, pointing to a massive buildup of the facility. Tartus is the end point of the so-called Syrian Express — , a name attributed to the supply route between the Black Sea Fleet's headquarters in Crimea and Syria — by the Russian press, and serves as the main entry point for Russian hardware in delivered to Syria. Igor Sutyagin, a senior research fellow at Britain's Royal United Services Institute (RUS), wrote in a new report released this weekend that by securing the base at Tartus and creating an air base at Latakia, "the Kremlin has shored up its own position as an important player in the current Syrian crisis — as well as in the Middle East of the future." "The rudimentary naval base ... in the Syrian city of Tartus is vitally important in allowing a Russian Navy squadron to maintain a permanent regional presence, underpinned by the operational flexibility afforded by onshore storage and maintenance facilities," he wrote. "Without a Mediterranean base, the squadron would be dependent on the smooth flow of supplies from Russia via the Turkish Straits and Gibraltar." Ben Barry, the senior fellow for land warfare at the International Institute for Strategic Studies think tank in London, said any Russian military action in Syria could employ some of the lessons it learned in the Ukraine in support of separatists fighting the government in Kiev. "The bases they are setting up gives them the opportunity to use reconnaissance and surveillance systems, fixed-wing air and drones, to improve the effectiveness of the government forces by improving their intelligence and understanding," Barry said. "Clearly they are in a position to conduct air strikes, and were they to introduce any of their long-range rockets they would be in a position to have some tactical effect. And they can do that without too many boots forward of their big base," he said. Barry said the new Russian presence gives Moscow the ability to use force in direct support of policy objectives of the Syrian military but "it also complicates the calculations of the US-led coalition as they have to ensure the two forces are deconflicted." The issue of deconfliction is a very important one, and something that Secretary of State John Kerry alluded to when announcing mil-to-mil talks in mid-September. After all, if Russian planes start flying regularly, there is a high chance they would interact with US or allied jets, raising the risk for both an accident and an incident. "The potential for a conflict between the US and Russia in Syria is very real, especially in light of Russia's recent deployment of military assets directly into Syria," said Julianne Smith, director of the Strategy and Statecraft Program at the Center for a New American Security. "That's why it is important for the two leaders to meet in New York next week." "First, the two will need to deconflict any potential military operations the two countries find themselves conducting against ISIS," Smith addedsaid. "Second, and more importantly, they need to begin a conversation about a negotiated settlement that must include President Assad's departure." Another major risk for Russia is that a service member may be captured by ISIS, said Theodore Karasik, a senior adviser to Gulf States Analytics. "The Russian Ministry of Defense and other agencies are going into Syria with a blindfold. Of course, the human tragedy will be paramount, but in this age of hybrid warfare, the infowar will [also] be paramount," he said. Karasik notes that the Russian military has experience in dealing with Islamic radicals and the fate of POWs who falling into their hands after fighting two bloody wars in its southern region of Chechnya in the 1990s and early 2000s. "We need to remember that during the Chechen conflict in the 1990s, gruesome decapitations were the norm, which only angered Moscow even more," Karasik said. Yury Barmin, a Russian expert on Middle East politics and military issues, said that Russian troops falling into the hands of ISIS would be "a huge blow" to Putin's strategy in Syria. "Domestically it may also spark protests, since the tragic memories of the Afghanistan campaign in the '80s are still painful for Russians," Barmin said. "But I think that the Kremlin is perfectly aware of this risk, which is why Russian troops will [likely only] be involved to an extent that would allow to avoid being captured by the Islamic State." Arabian Gulf countries, meanwhile, are vocally oppose Russia's involvement in Syria and blame US hesitation to act as the cause. In a statement, the Gulf Cooperation Council (GCC) foreign ministers urged a political solution to the Syrian crisis "without any foreign intervention," referring to Russia and Iran. Saudi Foreign Minister Adel Al-Jubeir called the Russian military moves an "escalation" and reiterated at a recent meeting of the GCC that Syria can have no future while Assad remains in power. Al-Jubeir added that while Riyadh prefers a political solution, "the military choice is still available, as the Syrian opposition is still fighting the regime with more efficiency with the passing of time". Saudi author and academic Dr Khalid al-Dakhil blamed US policy as worsening the Syrian crisis, adding that Russian President Vladimir Putin's presence in Syria is a direct result due to the American hesitation to act. "Vladimir Putin sees in front of him a reluctant American president in the last year of his mandate, Europe has no card against Russia have except limited economic sanctions, and in the Middle East seems in deeper disarray than it was before," al-Dakhil said. "For now Putin wants to fight ISIS in Syria but he would not want that to strengthen the Syrian regime nor depose it, however he wants al-Assad to step down but he does not know how or when that should happen," he added. That lines up with the popular view among Israeli policymakers and experts, many of whom believe the US refusal to remove Assad by force opened the door for Russian intervention, that forcing Israeli Prime Minister Benjamin Netanyahu to rush to Moscow with senior military leaders last week to see a "joint mechanism" to avoid "misunderstandings" between Israeli and Russian forces. However, Russia's relationship with the GCC has Is there real downside to the Putin government's actions, thought Russia's relationship with the GCC countries has never been particularly strong, noted Smith of the Center for a New American Security. "Russia is essentially taking some weak or tense relationships and making them worse, if that's even possible," she said. Sami al-Faraj, a Kuwaiti security adviser to the Gulf Cooperation Council, told Reuters the Russian intervention in effect means Syria is now would now be partitioned between a coastal strip held by Assad — who is from the Alawite minority, an offshoot of Shi'ite Islam — and a Sunni Muslim majority hinterland, all to the major benefit of Iran. "The GCC understands that a new Syrian entity carved out under Assad means preserving Iranian interests, which is to have a front in the Mediterranean," he said. "The Iranians have chosen the right great power to be with — the Russians." He said he expected the GCC to emulate the US example and seek to ensure that the armed opposition groups it backs in Syria did not engage the Russian troops in combat. The Gulf Arab states will continue to funnel weapons to the opposition groups, he added, but would "not give them with the objective of fighting Russian forces in Syria". So, what does Russia seek to gain by coming to Syria? Answers vary among geopolitical experts. Speaking at the Pentagon on Sept. 24, Col.-Gen. Stepan Poltorak, Ukrainian Minister of Defense, said that, in the eyes of the government of Ukraine, Russia's movement into Syria is "one of the factors to divert the attention of the international community from the problems in Ukraine." That lines up with RUSI's Igor Sutyagin, a senior research fellow at Britain's Royal United Services Institute, who believes Russia hopes its direct entry into the Syrian conflict could ease the damaging economic sanctions sparked by the invasion of Ukraine. SecDef Carter, however, was quick to state that any agreement with Russia on Syrian issues would not coincide with lifting of economic sanctions regarding Ukraine. "These ongoing discussions on Syria will not in any way take away from our strong condemnation of Russian actions in Ukraine or change our sanctions and security support in response to those destabilizing actions," Carter pledged as Poltorak looked on. Olga Oliker, director of Rand's Center for Russia and Eurasia, however, believes Russia's behavior in Syria is "at least as much about Syria as it is about Ukraine." She points to Russia's "real interests in Syria," which includes regional stability — which, to Russia, means keeping Assad in power. Russia, after all, has had issues with militant Islamic groups in the past. She also points out that there are a number of Russians, primarily from the North Caucasus, are now fighting in Syria. Estimates from the Russian governmentMoscow place more than 2,000 Russian nationals fighting on behalf of the Islamic State, and concerns that they might take the fight home to Russia are prescient in the capital. Some 3,000 citizens of former Soviet republics in Central Asia are estimated to have joined the ISIS ranks as well. But at the core of Russia's actions, analysts agreed, is Putin's desire to be seen as a world power. That role would be unquestioned if Putin can somehow force the US' hand to work with Assad in the fight against ISIS. "Russia is seeking to use the war against ISIS to rehabilitate its Syrian client, Bashar al-Assad," former US special adviser Hof said. "Moscow understands fully the role Assad has played in facilitating the rise of ISIS and sustaining it, particularly with attacks on Syrian civilians." Putin, Hof believes, "wants to move Barack Obama all the way from 'Assad should step aside' to 'We have to work with Assad to defeat ISIS.' It's very audacious and it's not likely to work." "Putin sees an opportunity and he's going for it. If he can force the Obama administration into bed with Bashar al-Assad it would be a major diplomatic coup." John Herbst, former US ambassador to Ukraine and now director of the Atlantic Council's Dinu Patriciu Eurasia Center, agrees that's the goal. And like Hof, he does not believe that will be successful. "If he hopes that somehow this will lead to an improved relationship with the U.S. and Europe because they will 'need Russia' in Syria, he will be disappointed," Herbst said. "The West will not appreciate Moscow's strengthening of Assad." By Aaron Mehta and Joe Gould in Washington, Awad Mustafa in Abu Dhabi, Andrew Chuter in London, Barbara Opall-Rome in Tel Aviv and Matthew Bodner in Moscow.